Hello again. My name is Sam and I watch about as much football as I can. I know it’s not easy to catch every game, so I’ve recapped some of them here in part two of our What I Saw series. Feel free to ctrl+f for your players if you don’t want to read the whole thing, and good luck in week 12! QB: This game was a lot of really good defense or a lot of terrible offense depending on your point of view. Both teams started out moving the ball fairly well but kind of beat themselves with trick plays gone awry or shaky passing from their QB’s. The best example of this was in the 1st quarter when the Giants ran a trick play where Eli Manning pitched the ball to Shane Vereen only for Vereen to toss the ball towards Evan Engram and was picked off. The Chiefs did almost exactly the same thing later in the game using Travis Kelce to throw an interception. Manning hasn’t been helped by receivers dropping balls, but a lot of his passes were not great throws to begin with. That’s been a theme in many of Manning’s games and is unlikely to change this season. Alex Smith looked like the old Alex Smith with a bit of Manning thrown in. Gone was the gunslinger from earlier in the season and in his place stood a conservative game manager who still somehow threw 3 picks. Smith had few deep passes this game and I personally think that the Chiefs are beating themselves by using too many trick plays/concepts and not enough pure aggression in moving the ball downfield quickly. KC has already shown they can be aggressive and win, so I hope they get back to the good stuff next week against Buffalo. RB: Kareem Hunt looked pretty darn good. Unfortunately, KC wasn’t able to get much going, but he made 73 yards on 18 carries against a defense that really showed up today. Whatever the Chiefs’ struggles of late, it’s not Hunt that is at fault. Orleans Darkwa had a pretty nice game. He looked hungry for yards and the run blocking was better than it has been. He still had a pretty low YPC but for every run where he was caught at or behind the line of scrimmage, he had a pickup for a 1st down. Wayne Gallman is clearly just a change of pace back and this is Darkwa’s backfield. WR: Tyreek Hill still passes the eye test. He had a lot of yards after the catch and if I had to say anything really accounts for his down performance this game, it’s that the Chiefs returned to their slow-paced short passes for long, clock-eating drives again. With this stinging loss, I would hope KC spends this week figuring out how to stretch the field again. That wouldn’t just help Hill, that would open up lanes for Hunt as well. Buffalo’s defense has been exploitable lately so I expect a bigger game next week, but it’s hard to say as this marks 3 weeks with under 70 yards through the air. I can’t say that any of the Giants’ receivers stood out, other than an amazing catch by Roger Lewis that set up the Giants for the game-winning field goal in OT. Unless Manning can play better, you’re not likely to get much yardage from any receivers on this team. TE: Travis Kelce had a crazy game. One the one hand, he had a dominating performance of 14 targets for 8 catches and 109 yards. On the other hand, he caused one of Smith’s 3 interceptions and tossed his own interception- a very long downfield passing attempt in yet another trick play gone awry. He’s now the #1 TE in standard, though, so be excited if you own him. He’s such a big part of the KC offense, there’s surely more to come. Evan Engram had a pretty down day, but it looked as if that was only partially his fault. He did commit offensive passing interference to negate a big catch, but several throws from Manning just weren’t where they needed to be. He’s been pretty hot this season and a big part of the offense, so it would surprise me if he didn’t pick it back up next week against WASH.
QB: The Bears started this game out hot. They scored on their opening drive for the first time this season (just a field goal, but still), then a sack/fumble/recovery turned into their first touchdown to go up early 10-0 against their NFC rivals. Mitch Trubisky looked pretty darn good doing it, too. Trubs even rushed a couple times for first downs including a heroic effort in the final drive of the game. It was downright refreshing for a Bears team that has struggled all season. On their next drive, the Lions recovered a fumbled snap for a TD, but the Bears would not be deterred and marched right downfield for a rushing TD the next drive. When the Lions took over the lead, the Bears fought all the way into FG range to try to tie the game and put it into OT, but Connor Barth completely whiffed it to lose the game. Matt Stafford did what Matt Stafford does and threw a bunch of yards with a couple TD’s to go with it. He had tons of time in the pocket, so no interceptions for Stafford today. He’s looking great with plenty of weapons, fire him up with confidence. RB: Tarik Cohen was used early and often, and it was working. He was used for a few rushes including a fantastic rushing TD and in the passing game. One hopes this signals a return to form and they won’t forget about one of their most dynamic players going forward. Jordan Howard also had a fantastic game. He looked powerful running and was picking up huge chunks of yards running for 125 yards on a mere 15 carries. The Bears’ OLine really showed how great they are at run blocking. Ameer Abdullah had kind of a down game that was buoyed by a receiving TD. It is heartening to see him get some use in the passing game, especially as Theo Riddick actually had a much better game on the ground. I doubt this signals a change in roles, and Riddick will likely only be a FLEX play in PPR. WR: While Turbisky is showing a lot more development as a QB, and looks to be getting better, he’s still not getting a ton of help from anyone in particular. Dontrelle Inman, the presumed number 1 receiver for the Bears only got 5 targets. If the Bears didn’t have so much success on the ground, I would guess that Inman would be the primary beneficiary of upgraded passing. Kendall Wright continues to be little more than useless. Marvin Jones, Jr, however showed up to play today. He looked great on his catches and my hope as a fan of his is that he continues to be the #2 behind Golden Tate. Tate had sort of a slow day, but likely because Marvin Jones’ light was shining so bright. Kenny Golladay only had a few catches, but those 52 yards are evidence of his big play ability. He’s just a dart throw in fantasy outside of injury, though, as even TJ Jones had more targets and about as many yards. This was a game where Stafford spread the ball out quite a bit. TE: Adam Shaheen looked like the best receiver for the Bears this week. It’s hard to call it a trend as he only had 4 targets, but he grabbed an early TD pass, Trubisky’s only one of the day. I’ll be keeping an eye on him in case his usage increases in the coming weeks. Eric Ebron continues to be a high volume target for Stafford, but he isn’t doing much with it. He did manage a big play in the game-winning drive for the Lions where is defender fell down, but it’s hard to trust a guy whose 49 yards were the second-highest yardage total on the season. 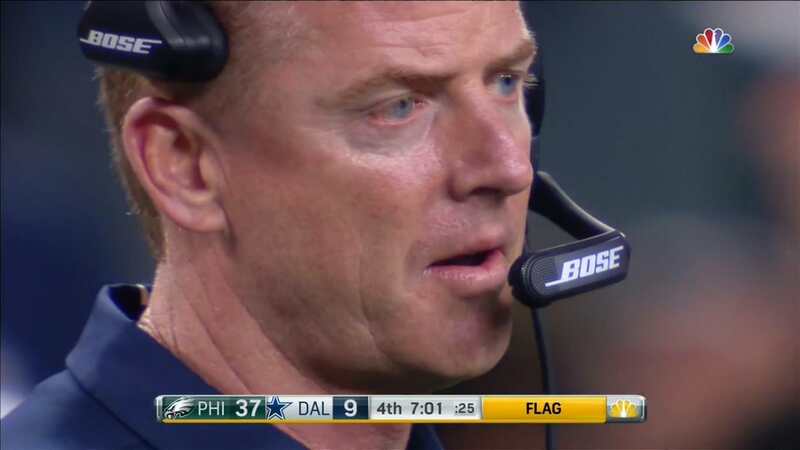 QB: Here’s a picture of Jason Garrett as his Cowboys received a drubbing at the hands of division rivals Philadelphia Eagles. Notice the frustration. It’s very similar to how Dak Prescott looked as he threw 3 INTs and even fumbled for a return TD. It was a spectacular failure that the young QB is certainly not used to. One might try to pin the struggles on the temporary loss of Tyron Smith, but I don’t think that was it. The Eagles and the Cowboys are division rivals and the Eagles basically just got the best of them. It’s been a hard season for the ‘Boys as they finally lost Ezekiel Elliott for a 6-game stretch and are seeing their rivals dominate not just the division but all of football. This game was a case of fantastic defense, pure and simple. The Eagles gave little room to the Cowboys and the stinging will surely last for quite some time. This game was also a case of fantastic offense. Carson Wentz is having an MVP season and the Cowboys could do nothing to stop it. Wentz only threw 2 TD’s, but after kicker Jake Elliott went out with a concussion he also threw 3 2-point conversions. It was just another feather in the cap of the now #2 QB in the Standard. RB: Alfred Morris had the best day of all the Cowboys fantasy-wise. He rushed for 91 yards on just 17 carries and he looked good. If he’s the lead back, which it looks like he is, despite being out-snapped by Rod Smith who managed just 11 yards on 8 carries. AlfMo would have had a much bigger day if the ‘Boys hadn’t been so thoroughly creamed. My guess is Smith will be in there when they want to preserve Morris. Jay Ajayi continues to impress with the Eagles, gaining 91 yards on a paltry 7 carries. Most of that was due to a big play where Ajayi broke through the line and ran his heart out downfield for 71 yards before being tackled from behind. He continues to rotate with LeGarrette Blount and Corey Clement, but I’m not sure what Doug Pederson sees is the point of that. I wonder how much of this activity in the backfield is just Pederson wanting Ajayi to get more experience on the team before stepping up, or if he’s taking a hot hand approach. The truth is, all 3 backs contributed, although it was actually Clement that seemed to be featured this game. If you are putting any of these guys in the lineup next week, I wish you luck because that is one heck of a dart throw between them. WR: Nothing is going to change for Cowboys at WR, of course. Dez Bryant is still Dez, Terrence Williams seems to be firmly back as the #2, while Cole Beasley and Brice Butler are more or less afterthoughts. Beasley does, of course, get some TD’s here and there, but that is very hard to predict. Bryant’s stat line tells the picture of the night: 14 targets, 8 receptions, just 63 yards. It was rough. I would hope for Bryant to bounce back, but his next few weeks also look pretty rough. My boy Alshon Jeffery, on the other side of the ball, had a great night. After struggling through most of the first half of the fantasy season, Jeffery has looked rejuvenated these last few games. He is catching contested balls and snagging TD’s, including a 17-yarder this week. Nelson Aghalor would have had a touchdown as well, but it was called back, so Wentz’ other TD instead went to Torrey Smith who didn’t have many yards to go with it. Part of that is Wentz simply not needing to throw much, but part is that they’re simply taking a backseat to Jeffery and Ertz. TE: Jason Witten was nonexistent. Maybe it’s just because Dak as a QB seems to like taking shots more downfield than Witten normally is, or maybe it’s because Witten is needed to block more. I don’t know, but Witten had only 1 target and that seems to be the way his season will go from here on out. Zach Ertz was actually the biggest surprise for a slow night. I’m not sure if he’s still got a lingering injury, or what, but he was not featured this game as he has been in the past. His 8 yards is more than likely a product of his lingering hammy, but given that he was off the injury report my guess is that the Eagles are just being cautious and next will go better. QB: Dare I say it, Blaine Gabbert didn’t look half bad. He didn’t look half good, either. I kid because Gabbert at least did well enough that Bruce Arians seems to be sticking with him for the time being. His first two touchdowns were set up by great defensive plays giving the Cards good field position, but his 3rd TD was a march downfield followed by a great pass for a catch-and-run into the end zone. It was unfortunate for Gabbert that all that great football happened in the first 3 quarters, only to be spoiled by 2 INTs on successive drives in the 4th quarter. Next week promises to be a much tougher match against a really sharp Jaguars D. Tom Savage also started off looking pretty hot all the way up to a really well thrown TD to Lamar Miller in the 1st quarter. After that, he was very up and down and I do mean very. Some of his passes sailed way too high or low, and some were spot on. With just one 1 INT (although Patrick Peterson almost had 2 more) and a win, Savage will keep the job for at least one more week. With Bill O’Brien’s demanding expectations for a QB, I’m not sure anyone else currently available could be much better. RB: The Texans D gave no room to run for Adrian Peterson. He gained just 26 yards on the ground over 14 carries. It wasn’t because he can’t run, it was because AZ cannot run block. It won’t be any better against the Jaguars next week. Kerwynn Williams is clearly behind Peterson and also seems like his role is more in the passing game. Lamar Miller also couldn’t get much going on the ground as the Cards routinely met him behind the line of scrimmage. He did have plenty of chances but ended with 61 yards on 22 carries. D’Onta Foreman was almost twice as efficient and had two great TD runs, but it cost him his Achilles tendon and he now out for the season. Interestingly, the Cards have cut RB Andre Ellington and the Texans have now picked him up and expect him to play immediately. Anything but Alfred Blue, I guess. WR: Larry Fitzgerald had a great performance with 91 yards and a touchdown. He made a number of tough catches and really played his heart out. The rest of the Cards’ wide receivers all played so poorly that Arians is now considering bringing in extra WR talent to make them compete. There were quite a few bad drops, even if Gabbert’s throws weren’t always perfect. DeAndre Hopkins and Bruce Ellington made quite a 1-2 pair this game. While Hoppy had the big plays, including an amazing TD catch where he straight up outmuscled Patrick Peterson (that’s an amazing feat, if you weren’t aware). Ellington was all over the field and seemed to be peppered with targets. His day was somewhat spoiled as he fumbled the ball after a big catch only to immediately recover it. The loss of points due to fumble belies that he actually looked pretty OK. I wouldn’t play him against the Jags, but if you need a receiver, weeks 13 and 14 look OK if Savage doesn’t muck it up for him. TE: The Surprise of the game was Ricky Seals-Jones. If you haven’t heard that name before, neither have I. Apparently he’s a converted receiver, and while he only caught the ball 3 of 5 times, he had 2 fantastic touchdowns. Given that this was his only game outside of a single snap earlier in the season, it’s impossible to know if he’s worth a pick up, but he looked pretty darn good against a Houston defense that bleeds points to TE’s. If you can afford the stash, he has juicy matchups in weeks 15 and 16, though of course his usage leading up to then should be monitored for consistency. None of the Texans TE’s looked particularly good. Even C.J. Fiedorowicz only had two targets and two catches and minimal yards. I wouldn’t look to the Texans for a TE. QB: What can be said of Tom Brady? He Brady’d the heck out of the Raiders in Mexico City this week, tossing just shy of 340 yards and 3 TD’s. He looked about as good as he does on a good day. Derek Carr was not as good, but he wasn’t bad. His receivers were pretty bad, struggling with drops a number of times throughout the game and then Seth Roberts had terrible ball control resulting in a fumble right in front of the goal line. I hope Carr can recover because he has a ton of talent and it would be a shame to see it wasted, but his receivers need to get their heads on right. RB: Dion Lewis seems to be firmly in control of the RB starting role for NE. James White has been fading these last few weeks and while Rex Burkhead fumbled early on and didn’t seem to see much work thereafter. Marshawn Lynch is finally looking good. He gained some chunk yards and averaged over 6 yards per carry. The biggest hamper for Lynch was just game flow, which will put his production at risk as the Raiders can’t seem to get much going on offense these days. WR: Brandin Cooks looked really good this game. His 149 yards were child’s play and his 62-yard catch-and-run TD seems to have cost the Raiders’ defensive coordinator his job. Danny Amendola also had himself a day catching the ball 8 or 9 times, including a touchdown. Michael Crabtree, Amari Cooper, and Seth Roberts all ought to be ashamed of themselves. 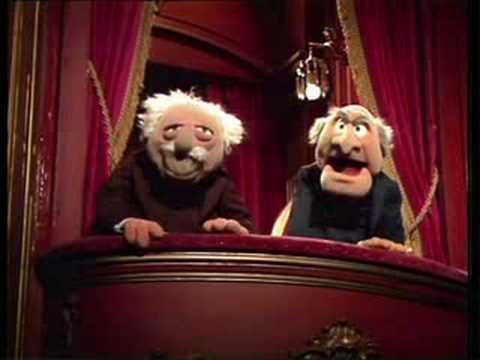 They played very poorly and were not making catches they need to make.I suppose you can’t really bench Crabby or Cooper but they aren’t looking very trustworthy right now. TE: Rob Gronkowski had a pretty quiet night, though I’m not sure how to account for that. This game was an aberration, though. Gronk is still Gronk, so I’m sure next week will be better. Jared Cook had similar problems to the rest of the Raiders’ pass catchers, securing just 2 or 5 passes. Maybe it was playing in a different country, but the Raiders need to get their game together. QB: Jared Goff had a bad game almost entirely because MN just has that good of a defense. He threw for 225 yards, and it is pretty admirable that he still had 0 interceptions. He’s still a good QB, so I’d expect a better performance against NO next week which lost 3 defenders to injury this week. Case Keenum is continuing to have a career season. Bradford is out and it appears like Teddy Bridgewater is able to play, but the Vikes are sticking with Keenum until they can’t. For most of the game Keenum faced tough going but eventually was able to pick on rookie CB Dominique Hatfield after he took over for concussed starter Kayvon Webster. RB: The Rams can be run on, and that’s exactly what happened as Latavius Murray destroyed them for 95 yards and 2 TD’s on 15 carries. MN was able to exploit big gaps against the Rams with excellent run blocking and I think this was just a case of Murray’s style a better fit to the game compared to Jerick McKinnon. It feels like Murray is starting to take a bigger share of the backfield, so next week against DET will be telling. Todd Gurley had a pretty quiet game, thanks in large part to the Rams being behind for most of the game, but even when he did run it was hard to find room. Hopefully this won’t repeat as Gurley’s schedule is pretty tough the rest of the season but he has still been effective in recent weeks against tough defenses. WR: Adam Thielen is the biggest beneficiary of this game, catching 6 of 9 targets for 125 yards and a touchdown. Most of this is attributable to beating a rookie CB who was simply outmatched skill-wise. Stephon Diggs was pretty quiet opposite Thielen, but his coverage was better and when you have a player like Thielen getting open with ease, you don’t really need much from anyone else. Diggs might have done a little better, but one of the catches for over 20 yards was called back due to penalty. I like him to bounce back against the Lions. Robert Woods who has been having a stellar season went 8-of-11 for 81 yards before leaving with a shoulder injury. It’s a shame because he looked pretty darn good even against the Vikings. Sammy Watkins is not getting many targets of late and only managed 36 yards. Rookie Cooper Kupp is getting more targets than Watkins, but he managed to fumble right at the goal line when the game was still tied, and the Rams never seemed to generate much offense after the turnover. With Woods out, I expect Watkins and Kupp to both do better, but it’s anyone’s guess who will be the bigger beneficiary. TE: Kyle Rudolf did just OK this week. He was targeted 7 times and some of his 5 catches were big ones. He doesn’t have to seem much of a ceiling but he’s a regular part of the Vikings’ offense so play him if you don’t have someone better. The Rams aren’t making much use of their TE’s, so maybe don’t pick up Tyler Higbee, though it is interesting to note his 5 targets. He seems to be more of a dump-off guy so I doubt that translates into much for the remainder of the season.